Will Hutchins on Robert Mitchum. “Hello, the camp!” called a deep voice from the already darkened woods. “Hello, yourself!” Peter called back as he stirred the campfire. “Come-on in!” “Rider coming in,” answered the man’s voice, as horse and rider emerged from the sea of darkness into the light like a babe from baptismal waters. “Just in time. I’m fixing dinner. There’s food and water over there for your horse. Get him settled and come join me.” The rider unsaddled his horse and, holding out his hand as he approached the fire, said, “I’m Bob.” “Peter,” said the cowboy, offering his own hand. “Have a seat. Like something to drink?” “Coffee sure smells good. Wouldn’t happen to have any whiskey on you, would you? Sure could use a real drink.” Peter reached into his large saddle bag and pulled out a silver shaker and a glass. “Just happen to have a Tangeray martini. That do ya?” “Double.” Peter shook and poured the martini and handed the glass to Bob. “Cheers,” Bob said, and took a long pull on the drink. “Hello, the camp! Rider coming in!” called a voice from the darkness. “You’re welcome! Come-on in!” Peter called back. “And I’m waiting for him.” The new rider rode into the campfire light. Bob recognized him immediately and rose to his feet. “Food and water for your horse over there. Come join us when you’re done,” said Peter. “Th…Thank you, that’s very kind of you,” said the rider and turned to care for his horse. Awhile back, Babs and I wrote to Christopher Mitchum, sharing our sorrow over the passin’ thru of his dad. “Rider Coming In” is his beautiful response. To me, Bob was more of a humanist, a philosopher with deep Irish humor, than an actor. He seemed to say in each role, “Nothing matters all that much. And most things don’t matter at all!” The consummate pro, he placed himself at the service of his co-workers and the story. He knew the picture was the star. Always has been. His style was practically invisible and practically universal. How moving and happy to watch him get better and better, year after year, learning and working. He is one of our best actors and human beings. An Irish poem by W. B. Yeats reminds me of Bob: “Only that which does not teach, which does not cry out, which does not persuade, which does not condescend, which does not explain—is irresistible.” Bob is irresistible. Here’s lookin’ at ya, Bob. 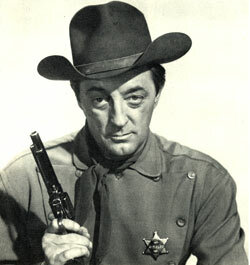 I never met a Mitchum I didn’t like… Adios!